No other animal has captured people's imaginations or changed heir lives as have horses. Their grace, strength, and beauty have made horses sought after as well as useful. What would kings and queens, knights and conquistadors, cowboys and stagecoach drivers, or farmers have done without them? 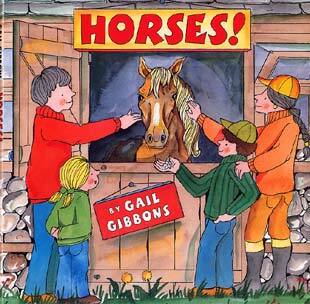 In this informative book, Gail Gibbons relates some of the long history horses and humans have shared. She looks at horse biology and behavior, and includes colorful, clear, and accessible diagrams that will interest all who want to know more about these popular animals.